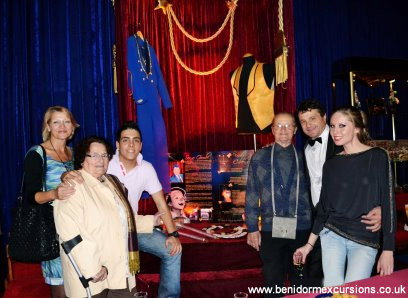 Elena and Brayan Gambi are two young artistes in the cast of “Circus Story” the new Benidorm Circus production. The youngsters are practically Circus Royalty as their grandparents and father were also circus performers. Elena is in her second year, studying for her Bachillerato, which is the equivalent of A levels in the U.K. She is a juggler in the circus, performing all her tricks “ en pointe”. She has studied ballet from a very young age and is also learning to play the piano. Brayan on the other hand performs an acrobatic number similar to one his father performed which he has updated with a basket ball as a prop and modern dance moves. 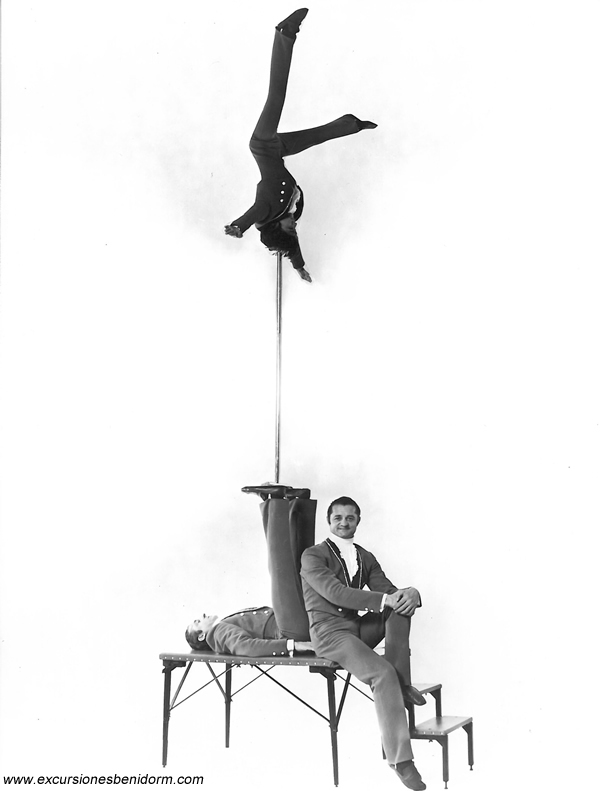 The Gambi Brothers, was an acrobatic act in which Jacques supported his brother on an 8 meter pole, while his brother performed tricks at the top. Their son Serge was born while on tour and as soon as he was old enough, he began to perform with his father and uncle (see photo). Today Jacques who was born in Lyon never misses his grandchildren’s performance in the Benidorm Circus and helps out where he can with advice and tips. Like all grandparents he beams with pride when talking about his third generation circus grandchildren. The circus is his life. Dad, Serge Gambi is just as proud and is there to encourage and train his children (read our interview with Serge Gambi). Terra Natura welcome a male fawn into their park with the birth of a Sambar Deer. The Sambar Deer (Cervus unicolor) is the most widely spread deer species in the world and is found in many countries in the Asian Continent, it is also one of the largest. No intervention was needed from staff at the park during the delivery although Pietro was given a full examination by Veterinary staff once delivered and received a clean bill of health. In total eight fawns have been born in wildlife park in Benidorm since this species was introduced into the park. There are currently 11 Sambar Deer, three female & eight males in the park. Captive breeding of this species requires sufficient space for the deer to develop relationships, socialize and for the courtship rituals, as well as adequate living conditions. Reproductive success is a clear indication of the welfare of the animals and that they have adapted to and are happy in their environment. The Sambar deer has an extremely sharp sense of hearing and smell. When threatened the Sambar deer hide in thick vegetaion to avoid predators and sometimes jump into lakes or rivers to escape from their attackers; they are excellent swimmers. Size and weight varies according to each individual and can range from 175 to 300 kilos. Take a look at some of our photos of Terra Natura. 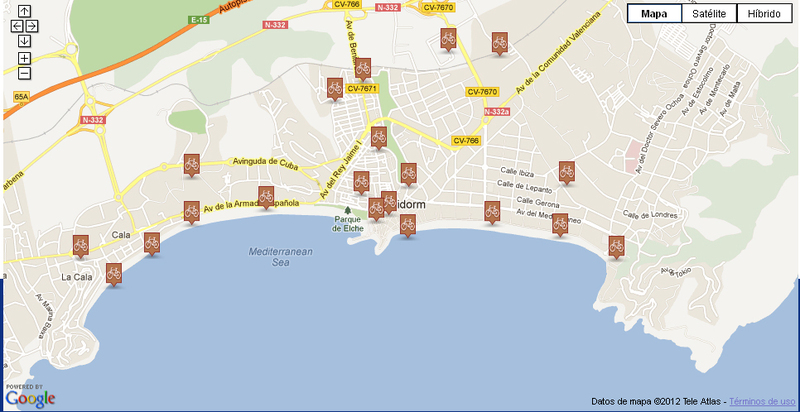 Bicidorm is a bicycle hire service introduced by the Benidorm Council to promote the use of bicycles in the city. Its aim is to reduce pollution, energy consumption, and to offer an alternative way to get around the city for residents and tourists alike. The service, which currently has 20 bike stations in Benidorm, hopes to expand to 40 bike stations or bases in the future. The service is easy to use. Go to any of the bases, where you will find a touch screen computer (consult the map to find the location of the bases) Follow the instructions on the screen, then take your bike ensuring it is in good condition and off you go! When you have reached your destination, find the nearest bike base with an available space and secure the bicycle to the base, ensuring that the bicycle has been locked securely in place. The bike can only be used for a maximum of two hours at a time, before it must be returned to one of the bases. Half an hour must have elapsed before taking another bike out again. The service is available all your round, 24 hours a day, subject to availability. Fines will be applied if the bike is not returned on time. If the return is 30 minutes late , one day fine. If the return is between 31-90 minutes late , three day fine. If the return is between 91 minutes and 10 hours late , one week fine. If the return of the bike is more than 10 hours late, one month fine. If the user continues to return the bike late, they will be barred from using the system. To find out more on the terms and conditions , consult the Web site www.labici.net . Users must be over 14. For those under the age of 18, permission must be given by a parent or guardian. For yearly rental register on the website. 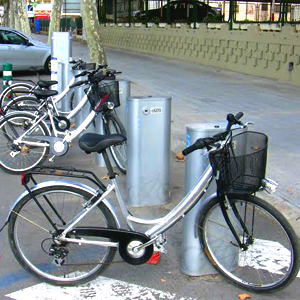 All daily, weekly and monthly rentals are done at the computerised bike bases in Benidorm. Ayuntamiento de Benidorm- Benidorm Town Hall. Palau d Sports L’ Illa. If you would like to rent a mountain, city bike or racing bike (with or without GPS) click here for another alternative. The Bodegas Mendoza winery in Alfas del Pi, has one of their wines, the " Tremenda 2009" publically acclaimed by the New York Times. The Mayor of Alfas del Pi, Vicente Arques, congratulated the Bodega, and said that the town of Alfas del Pi is extremely proud of their success. The latest wine tasting report, by the New York Times Wine Critic, Eric Asimov, places Bodegas Mendoza’s “Tremendous 2009”, a Monastrell, at the top of the list for “Best Value”. Eric Asimov, defines “La Tremenda 2009” as "Complex and well structured with long-lasting, savoury flavours of dark, plummy fruit and minerals". The Bodega is located in Alfas del Pi, in the heart of the Costa Blanca, not far from Benidorm and complements the tourist sector, offering an opportunity to discover new experiences. Book a tour to visit the Bodegas Mendoza winnery. Terra Natura Benidorm now gives guided tours of the park with their “ZooTour Experience”, bringing visitors closer to the animals residing in the Benidorm Animal and Nature park. On the tour, visitors will be able to interact with some of the impressive animals from the Asian Continent accompanied by an expert guide. The aim of this new project is to enhance the contact between animal and visitor, allowing the public to interact with the animals by feeding them under the watchful eye of one of the park keepers. 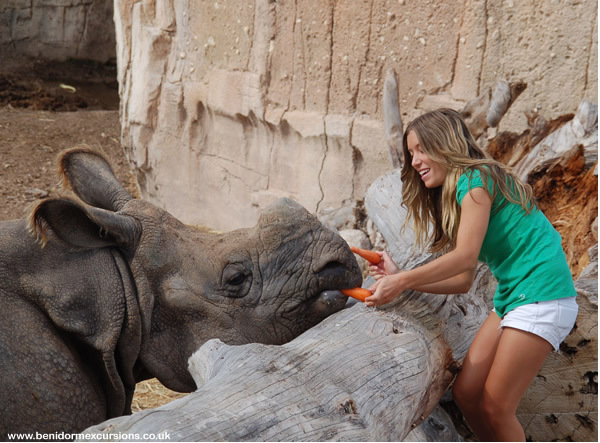 Visitors have the opportunity to feed species such as water buffalo, camels, Bengal Tigers, Nilgau antelope, Bison, yak or little Susto, the first indian rhinocerous born in captivity in Spain who was born in the Benidorm Nature Park nearly eight months ago, as well as Petita the elephant and her friend Kaiso. The tour also included a Bird of Prey demonstration with Harris Hawks, eagles, kites, vultures etc. Apart from the birds in the demonstration you can also see other species such as eagles, owls, storks and tropical birds. There is also the opportunity to interact with sea lions or slide down a zip line over the enclosure of the buffalo, camel, elephant and Antelope enjoying a birds eye view of these animals. Watch how the snakes and other venomous animals are fed is another of the activities on offer in this new programme. The “ZooTour” operates daily at no extra cost, it is included in the entrance fee. To make things easier for families to enjoy this Benidorm Theme park , there is a discount of 5€ per person when purchasing from this website.